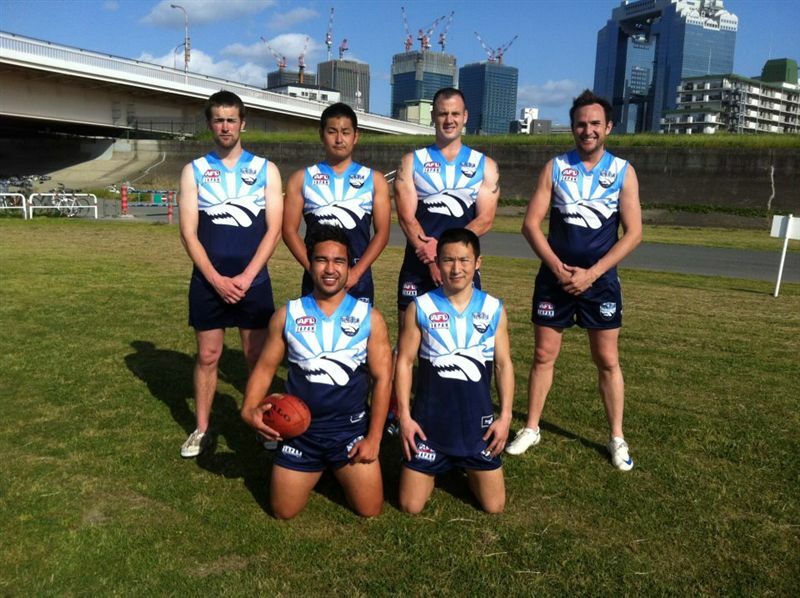 Can Osaka Dingoes go back-to-back In Japan AFL? The reigning Premiers of the Japan AFL, the Osaka Dingoes, one of only two non-Tokyo based clubs in Japan (Nagoya Redbacks being the other) currently have around twenty players. About fifty percent are Japanese, the rest ex-pat Aussies except for one American and a Frenchman. Osaka, third most populous city in Japan, after Tokyo and Yokohama is connected to many other major cities such as Kyoto, Nagoya, Yokohama and Tokyo (over 400 kilometres distance) to the east, and Kobe, Okayama, Hiroshima, Kitakyushu and Fukuoka to the west by the famous Shinkansen (bullet) train. All Dingoes away games involve long journeys that are costly for these amateur players, so dedication and passion to play footy is not in short supply. Dingoes premiership coach, Adam Reidy, a long serving player, coach and club stalwart since around the time of the club's foundation in1990, returned to Australia late last year and so the club has established a leadership group for season 2012. This group consists of President Jonathon Cooper (taking over from Yazid Dardah retiring after two years as president), Vice President Genki Tanaka, Captain Jun Oikawa and co-Vice Captains Louis Patterson and Drew Moon. Vice President, Genki Tanaka is somewhat a Japanese football success story, having won a scholarship to play football in Melbourne in 2006 with Box Hill North for the season and study English and acquire AFL qualifications in coaching and umpiring. He is very passionate about football and the Osaka Dingoes, and has been instrumental in developing the off field strength of the Dingoes over the last few years. Over winter the club had a recruiting drive and surprisingly managed to recruit more supporters and game day assistants than players. The Dingoes have recuited several new players though, one Daniel Perry, stands at around 195cm and despite not playing football for a number of years should bolster the ruck division for 2012, and two players from one of the Tokyo teams, who have relocated to Osaka for work. Big things are expected from Michiganite Chad Dykehouse, the 2011 Rising Star winner and Paul Welsh who has trained week after week throughout the winter. The team is also hoping that Brett Snowdon (an ex Peel Thunder colts player) can get down from Tokyo to play every game and that a couple of young Japanese guys will stick it out once they start playing matches. The Dingoes had a very successful season in 2011. Not only did they win the premiership, but were also victorious in the Japan Cup. The Japan Cup is a biennial round robin event held over one day. Last year it was held in Chiba and the Dingoes joined forces with the Nagoya Redbacks to take out the trophy. Brett Snowdon was named best player in the Japan Cup and he was best on ground in the grand final. Jonathon Cooper was 2011 best and fairest and was named All Japan ruckman. Over the years the Dingoes have had a number of players represent Japan in the International Cup and at the Arafura Games. Of the current squad, Genki Tanaka, Jun Oikawa, Ryosuke Hosomi, Ryosuke Aoyama and Tsutsumi Yuta have all played for their country. The Dingoes don't have a 'home ground' at present and like so many teams and clubs in world footy, train and play on any flat paddock (or not so flat) or park they can find, a task even more challenging given the lack of space in dense Japanese cities. The Dingoes currently train on a public field near the bank of Yodogawa River in Nakatsu, just west of Osaka Station. However the club's new sponsor, Kansai International Academy is building a new Elementary School in Osaka and the club is excited at the prospect of using the new school's sports fields as their home ground once these are completed. The Osaka Dingoes will run some Auskick style footy clinics around the Kansai region this year and in particular at the campuses of the Kansai International Academy, with the aim to use their presence within the international community of Osaka to continue to develop the depth of the playing list. They sell the football experience as an alternative method of learning English for the overworked Japanese, and an opportunity to get fit and make new friends at the same time. The Dingoes also maintain a fairly regular presence in the international clubs of Osaka. The Frenchman, Yannick Le Bellec, and Drew Moon both have weekend jobs as DJ's. Le Bellec has been seen behind the 'turntables' in his Dingoes jumper on more than one occasion. With the departure of several key players and personnel at the end of 2011, it will be a challenge for the Dingoes to maintain their position as the strongest team in the league. The all-Japanese teams didn't stop training at the end of last season, and several of the other teams are looking threatening. With the support of the Kansai International Academy, however, the Dingoes have become a power off the field as well as on in Japanese Footy, and the club is quietly confident that the Osaka Dingoes-"the only truly multicultural team in Japan, can go back to back in season 2012"
Thanks to Jonathon Cooper for assistance with this story. Leadership group wearing the new 2012 Jumper. Top from left: Chad Dykehouse, Jun Oikawa(Captain), Jonathon Cooper(President), Drew Moon(V Capt). Bottom fr left: Louis Patterson(V Capt), Genki Tanaka(Vice President).